The holiday mission is free to all, but IO Interactive does have one request. PlayStation 4, Xbox One, and PC Hitman players will be getting free Christmas content on Tuesday, December 13, although IO does have one request - consider donating to the World Cancer Research Fund. The mission, titled Holiday Hoarders, takes place in Paris, which has been given "a festive overhaul," although not everyone is feeling the Christmas spirit. You'll be tracking a pair of present-stealing thieves, and Santa may or may not be showing up - with a suit you may or may not be able to borrow, of course. "Cancer is something which affects everyone in one way or another at some point in their lives and we at IOI wanted to do something to help raise money for Cancer research," said Hannes Seifert, Studio Head at Io-Interactive. "We're supporting World Cancer Research Fund by giving away some fun free Holiday content to all HITMAN players and we ask you in return if you want to donate to a great cause, to give what you can via WCRF-UK.ORG/HITMAN." 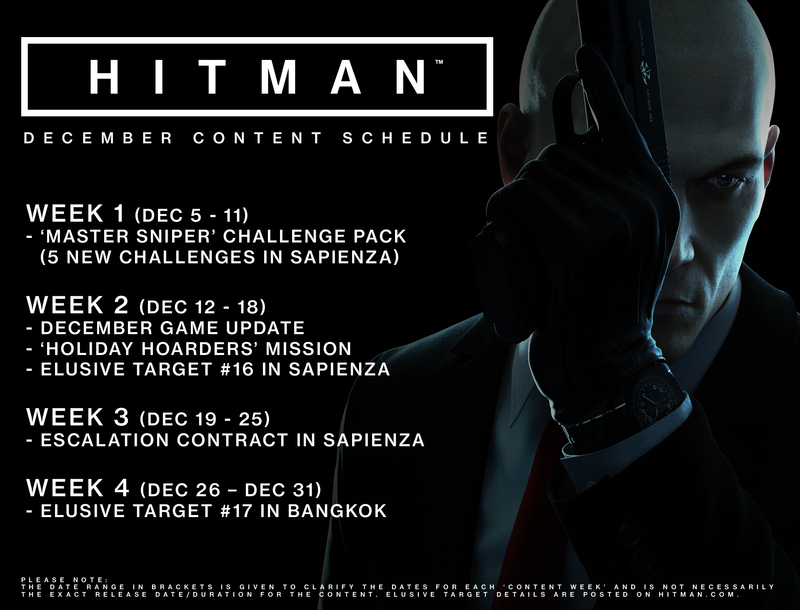 In other Hitman news, the game's November update added an offline profile, updated the statistics page,added an Opportunity Completion checkmark, and more, in what IO called "the first of a series of planned major game updates that will add new content and improvements" prior to the physical disc release on January 31, 2017.